“Trigence insists on providing audio-quality digital solutions without loss of acoustic quality. With virtual coil technology, DN3013 improves High Dynamic Range and offers low-noise performance as multi-bit scheme.” said Pete Birch, President and CEO of Trigence. Trigence Semiconductor Inc., the revolutionary digital audio IC and solution provider, today introduced the latest full digital driver IC, DN3013, for high-resolution audio, suitable for USB powered headsets, wireless speakers, sound bars and headphones for personal computers. With its newly developed "Virtual Coil®" technology, the DN3013, dynamically compatible with the DN30x2 series used in many audio devices, now offers a dynamic range of 114 dB, a low voltage power supply of 1.8 V and a power consumption of only 483 mW. The maximum output power is 12.5 W. In addition, special GUI software running on a Windows PC can easily operate a variety of DSP functions. VirtualCoil® offers low in-band and out-band noise for audio products like speakers and earphones. The conventional Class-D amp solution uses 1-bit PWM or PDM scheme where low-noise performance is limited. In order to achieve the best noise performance in other multi-bit PWM or PDM schemes, an internal LDO and/or multiple power supply sources are required. Trigence’s VirtualCoil®, using only a single, low voltage DC supply, achieves improved low-noise performance using proprietary multi-bit quantization instead of traditional 1-bit schemes. “Trigence insists on providing audio-quality digital solutions without loss of acoustic quality. The digital speaker driver DN3013 is targeted for portable audio products where low power and small size are essential. 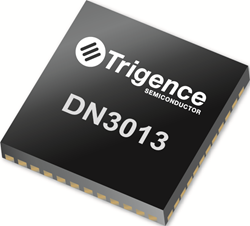 With virtual coil technology, DN3013 improves High Dynamic Range and offers low-noise performance as multi-bit scheme,” said Pete Birch, President and CEO of Trigence. Supports up to 32 bits of 24-bit 192 kHz input and DSP processing. Use of "VirtualCoil®" technology to extend dynamic range. Compared to the prior DN30x2 series, the dynamic range can now be increased by up to 6 dB. In headphone applications, not only a multi-coil but also a conventional single coil speaker driver can be used. With high driver efficiency of 90% and a low-power DSP running below 10 mA the amount of heat generated by audio devices is reduced, and battery-powered lifetime is extended. In addition, by combining the 5V power supply with the peak auxiliary power supply, the speaker product can obtain a loud volume from the USB power supply. In order to accurately process the input digital audio signal, a low jitter audio clock is generated with PLL from the I2S signal to faithfully reproduce the original sound. In addition, an evaluation board, DU1213 , including low-power USB audio controller and dedicated GUI, can easily adjust the audio effects by simply connecting to the computer via USB. Trigence Semiconductor, Inc. is a pioneering audio IC design and solution provider, offering revolutionary ‘pure digital’ audio products for the consumer and IT markets. Founded in 2006 as a spin-off from Hosei University and headquartered in Tokyo, Japan, Trigence received its first investment in 2012 from Intel Capital. Other subsequent investors include MIYAKO, Supreme, MIRAI SOUZOU, Nittoku and TDK. Its revolutionary Dnote® pure digital audio system has been widely used in computers, headphones, soundbars, smart speakers, CAR audio system and other audio products. Its customers include Intel, Audio-Technica, SHARP, Clarion and other leading consumer electronics manufacturers. *Dnote® and VirtualCoil® are trademarks of Trigence Semiconductor in the United States and other countries.